It's been another interesting one for my girl. She slept well and woke up tense but calm. 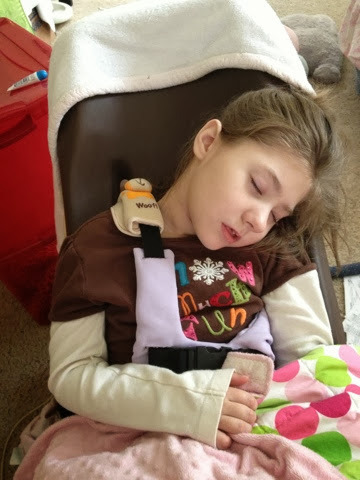 Definitely still on edge, increased chorea, cold/clammy hands and feet, hands constantly in her mouth (keeping her fingers so wet, the skin is now peeling off), grinding her teeth, etc... It's hard to tell whether she's on the verge of heading into (real) bad days or if maybe (hopefully) this is a more mild form of bad days thanks to the Lyrica. I guess time will tell. For the most part it's been an OK day. This morning she had a good session with her vision therapist (with a couple of random outbursts of crazy). Then 30min or so later (right before she was supposed to have PT), she had a major crying meltdown! We gave her clonidine and it did seem to help her calm down and eventually she took a little nap. When she woke, she seemed to be feeling better. Still very tense, but no more outbursts. Not a fan of diaper changes or being messed with (and definitely preferred a more structured chair), but no real fussing. Tonight she seemed to be getting tense again, so I gave her some ibuprofen, hopefully that will take the edge off whatever is bothering her. She's looking very sleepy, but when she starts to doze off, she pops back up with a burst of chorea! She's also showing some signs of nausea tonight...burpy, licking her lips a lot, and swallowing. Please say some prayers for sleep tonight and a major turnaround tomorrow! Ryan is not feeling well again, I think he has a cold or something! 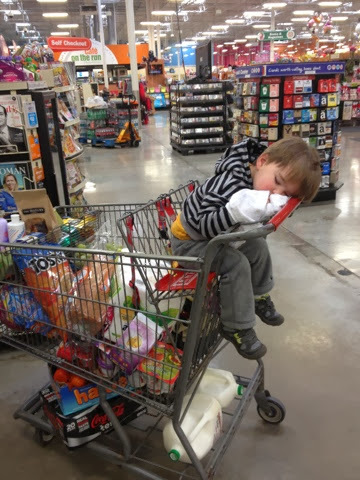 This is him at the grocery store today! This has NEVER happened before! It's been a bit if a weird day for my girl. She slept OK but woke up around 4am and was talking/laughing. I think she was dozing off and on, because when I got up at 7am, she was back asleep! It was a cold day today and there was a lot of ice on the roads, so we were nurseless until noonish! Reagan was good though, so it was manageable. She's been super sweet again today! Very cuddly and still...it's nice to see her so calm! She did get a little gaggy late morning and again this afternoon. No real throw ups, but some retches and a lot of tongue action. She's also had a case of the laughs off and on today. She does it in response to stimuli, but she's also just laughy in general (not necessarily a good sign...even though it's super cute)! She had a great session of OT and she's just been a complete sweetie all day! Praying for more good days for my girl! Reagan slept well last night and woke up super sweet and smiley again today! She had a gastric emptying scan done this morning. At first we weren't sure it was going to happen, as they still hadn't gotten insurance approval, but we got the call around 9:30am and had to be there by 11am. Reagan was as good as gold! She tolerated the whole procedure very well...being fed through her g-tube (even if it was just 2oz total) & being strapped down and unable to move for an hour (even though she desperately wanted to crunch up)! 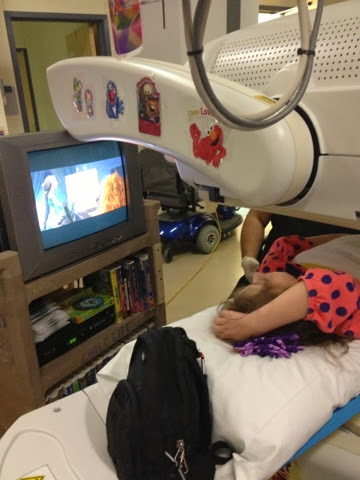 They took constant pictures for an hour (while she watched Brave) and then unstrapped her and sent us back into the waiting room for an hour and then came back and got us to do one quick 3min/3min set of scans. It all went well (less than 10% was left in her stomach) and we didn't have to stay for the last hour (unfortunately we never got to see the end of Brave). We left brother at home with Grandpa, saving our sanity! So Reagan had a pretty perfect day! She had an early session of OT and then a great session with her teacher this afternoon. Really the only issue we've had today is that she is still giving us grief in the pee department! She woke up with a dry diaper, never peed the whole time we were gone, we got her home and proceeded to apply pressure, heat, water, poop position you name it! She wouldn't go. Finally right before the nurse left, we decided to go ahead and try cathing her. No luck! She couldn't even get the cath in! I decided to try and help her poo (sometimes that results in a pee) and sure enough, after a good poo, she had a huge pee! The only pee of the day, but a pee nonetheless! Ugh! Not sure what she's doing in that department, but she's making me a little nervous! Tonight she was super cuddly, but slightly sensitive. Hoping for more good days to come (and really hoping that Lyrica will change things for the better)! Just typed a whole post and lost it! Here's the abbreviated version! Reagan had another great day today! She was a bit crunchy (hands up in her hair nonstop), had cold clammy hands on occasion, & was holding her pee again, but otherwise all was good! Super sweet & smiley! Making great eye contact and super snuggly! 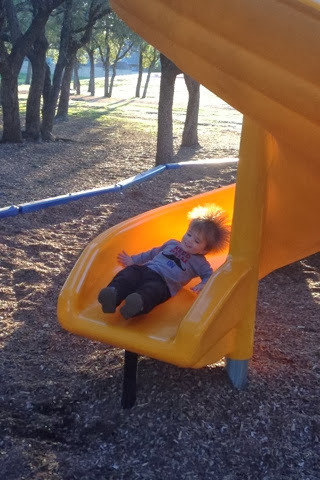 We took a walk to the park since the weather was so nice! 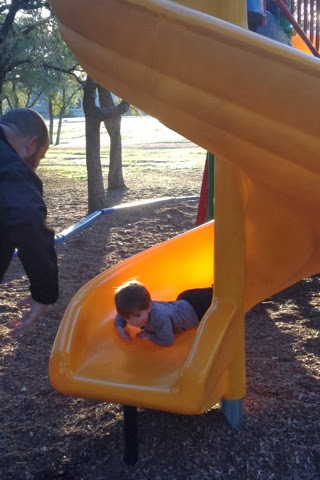 Reagan went down the slide and Ryan went down face first!! Reagan was a good girl today! She slept all night and woke up bright and early this morning very talkative and super smiley! Grandma drove in this morning and that of course made my girl happy! Her bad days have been falling on weekends for a while now, so Grandma hasn't gotten to see a lot of good days lately! Since she just came out of a bad streak, I'm anticipating a wonderful weekend for my girl! She was very visually attentive today and we were able to do her eyegaze twice and she was very engaged! (Too bad I had technical difficulties the first go round!) Loving these good days and just praying for more for my sweet girl! It's been another sleepy day for my girl! She picked a good day to sleep in because it was a COLD one (for Texas)! She has slept nearly the entire day today! The couple of brief moments that she was awake, she was very smiley and happy! (Giving us a little grief in the pee department...but she finally went!) So glad to see her feeling better once again! Grandma drives in tomorrow and is going to be so happy to finally be here for a good streak! Reagan fell asleep last night with the help of clonidine, but she woke back up around 2am (less than 3hrs later). Thankfully she didn't seem nauseous anymore, so I was able to go back to sleep and I think she probably drifted in and out of sleep off and on until the morning. She was wide awake by 7am, still kicking around a lot, wide eyed, and a little gaggy. 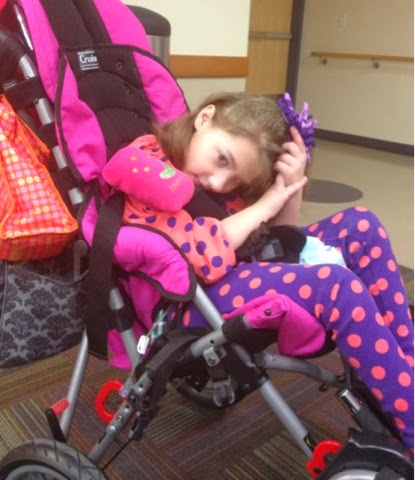 We decided to go ahead and try the clonidine again, hoping we could help her get some rest. She dozed off at 10:30am and has been sleeping pretty much ever since. She did wake up a couple of times but she still looked groggy and eventually dozed back off on her own! So glad my girl is finally getting some well deserved rest! Hoping good days are in our future! Sleepless, crazy chorea, & nausea...but otherwise good! Reagan did not sleep at all again last night! Kicking, kicking, kicking all night long (and day for that matter)! Now if it wasn't for the no sleep, crazy chorea, and nausea this afternoon/tonight...she actually would've had a pretty good day! She's been super sweet, wide eyed, and laughy today. Her hands and feet have resumed normal temperatures, but tonight she had the red ear and crazy nausea that was causing her to drip puddles of saliva from her mouth! Poor girl, she just can't catch a break! I'm really hoping the clonidine works tonight and she's able to sleep the nausea off (otherwise I'll be stick by her side all night trying to prevent her from choking herself)! 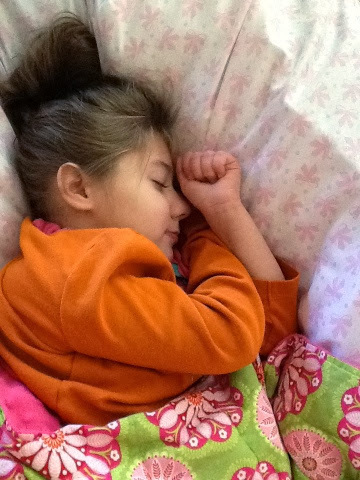 Please keep it in your prayers that she's able to get the sleep that her body so desperately needs tonight! Well there was sleep last night, but only for one baby! Ryan slept like a rock once we gave him the fever all, Reagan however, did not! Reagan woke around 1:15am fussing. I moved her from her bed, back to her chair but she wouldn't settle down. She also didn't care to have me messing with her. I tried clonidine, Lortab, ibuprofen...nothing seemed to help her in the least. She'd doze off for a minute or two (the only time she would quiet down) and then she'd be back awake, kicking, crying, & fussing! Needless to say, none of us got much sleep! Then this morning she was still pretty tense, but stable. She was not at all cooperative for vision therapy (probably should have just cancelled it)! Her chorea was through the roof today. Lots of craziness going on! 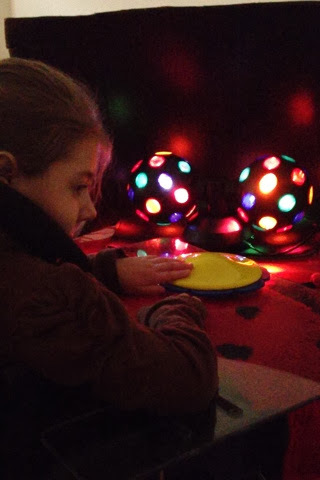 This afternoon she did have a major freak out but calmed down shortly thereafter and then had a great session of speech through the school system (her most attentive yet with the eyegaze system). Tonight she started sticking out her tongue a bit and then the nausea started. She had several big throw ups...tried clonidine for sleep but it only worked 20min or so. Not sure how I'm going to get her back to sleep now! (Brother went back to the doctor today...he's got ear infections in both ears now and his throat was even redder! They just have him the antibiotic shot...his first shot ever...remember, he's in immunized! Poor thing. I sure hope it starts working! He definitely feels terrible!) Please keep both of our babies in your prayers! 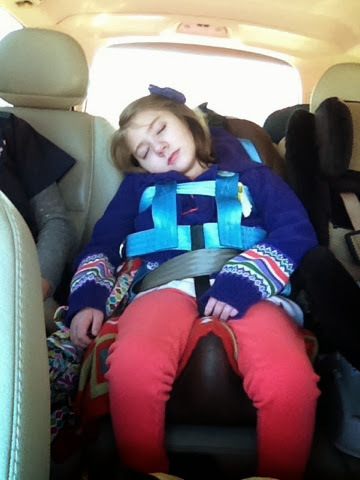 Reagan had a fairly good day today...all things considered. 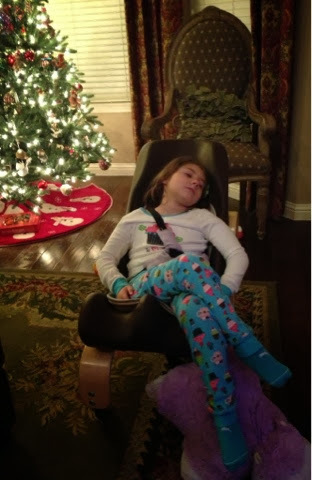 She slept OK in her chair last night. This morning she seemed stable enough, so we attempted a much needed bath before therapies. She didn't love it, but she tolerated it well. Speech therapy came at noon and she was good for that. 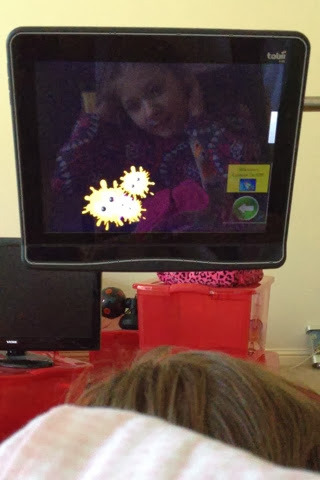 They were having some technical difficulties with her eyegaze device which was frustrating for her therapist, but otherwise it went pretty well. Then her OT came at 2. They resolved any issues with the device, but Reagan only tolerated being in her chair for 10-15 min, after that they just worked on some stretching! Reagan was still very tense all day, having tons of chorea (those legs were going nonstop). In the afternoon, she seemed a little more sensitive, but maybe she was just annoyed at her brother's craziness!?!? 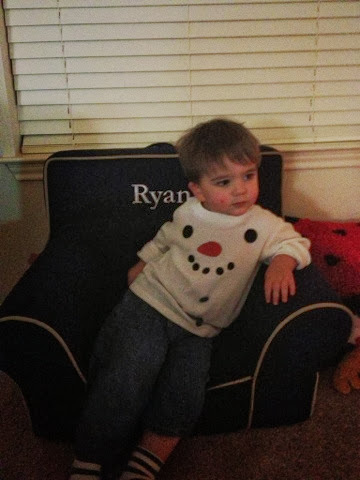 Ryan went in to the doctor today and he has an ear infection (hence the fevers). He refused to take his antibiotic in food or juice and then I couldn't get him to eat or drink anything all night! That means no Tylenol or ibuprofen either! After a luke warm bath, we put him to bed with a 102.5 fever. He woke back up less than an hour later crying, red as a lobster, with a 103.6 fever! Daddy ran to the store to get some fever all (acetaminophen suppositories). Thankfully we were able to get his fever down to 101.5 with that and he fell back to sleep. Reagan laid down in her bed for the first time in a while. Hoping she and her brother can sleep tonight! 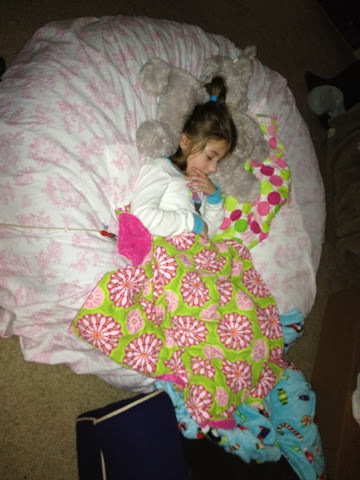 Reagan actually slept well last night (in her bean bag chair). She woke around 6:30am making a little noise and sliding down her chair. I moved her to her tomato chair and tried giving her clonidine, but it didn't do a thing. Thankfully I think she was good just being in a more supported position, so she we went back to sleep. She's actually been pretty good all day. Still very tense, lots of chorea, and not wanting to be messed with most of the day. Tonight she didn't seem to mind us being near her, but that's when the nausea started up! She's had several big throw ups and a few false alarms. Her tongue is sticking out more and you can just tell she doesn't feel well. Poor girl. I can't imagine throwing up as often as she does! Awful! Speaking of...Ryan had a huge throw up yesterday after I tried to shoot his antibiotic down his throat! Then today he's fine all day but has a fever when he wakes up from his afternoon nap (no idea what this is about)! Tonight you could tell he felt awful, the fever came back up, and he was fighting sleep! I'm praying both of my angels can sleep tonight! Get away sickies!! Reagan was very restless last night. I gave her clonidine and Mike laid down with her, but she was restless. I dozed off on the sofa and Mike dozed off with Reagan and neither of us got to bed til around 2am! Then around 6:45am I hear Reagan fussing. Mike laid down with her again, but she was not settling down. It seemed the bad days were upon us. I gave her a dose of Lortab and we put her in her chair, but she would not dose back off. She was super tense, grinding her teeth, and very restless, kicking around nonstop, but quiet (just a fuss hereand there). But any time I came near her to give her medicine or pull her hair out if her eyes, she'd freak out and start getting irate! That continued til about 10:30am, when the real crying began! And when I say crying, I mean CRYING! Gut wrenching, hold her breath til she turned purple, in serious pain sort of crying! Neither Lortab or clonidine seemed to help today. I gave her one dose of ibuprofen that seemed to help (she fell asleep shortly thereafter), but the second time I tried it, not so much! Tonight she mellowed back out and though tense, she was quiet once more watching tennis with Daddy! I'm seeing a lot of yawns right now, so I'm hoping she's going to sleep tonight. Please keep her in your prayers!! So...what happened with the care conference yesterday? I guess my expectations were too high! What was I hoping for? 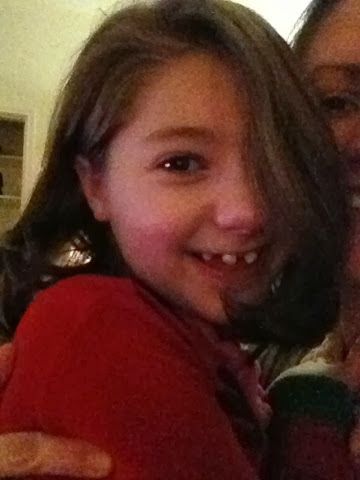 I can honestly say, a miracle (my girl deserves no less)! I was hoping that by getting all of these great minds together all for the sake of Reagan, that someone would come up with something novel. Something we've never thought about, a test, a trigger for what might be causing these bad days. Now, granted, I was not there so I don't really know what all came up (which I feel was a huge mistake...they should have allowed us in there to keep them on task and clarify as needed), but based on what palliative care (and GI) told us this morning, I'm unimpressed. The tests recommended were all things we've already discussed. I don't know. I don't feel like we even have much of a plan. All of their hopes are resting on the shoulders of Lyrica controlling her bad days! And while I feel migraines are a very real possibility for some of the pain she experiences on a bad day, it doesn't explain everything! (And so far we've seen no difference since starting it, except for some weird arm movements!) Why did her bad days/nausea go away when she was on that low calorie formula? There has to be a GI component to all of this! Ugh. I'm just so frustrated! On a good note, my girl had another good day today. She slept well last night, so well, she was still asleep this morning and we woke her up trying to get her into the car! We had to take her brother with us to this appt (because grandpa has been sick with the flu) and boy was that a big mistake! He's a mad man! 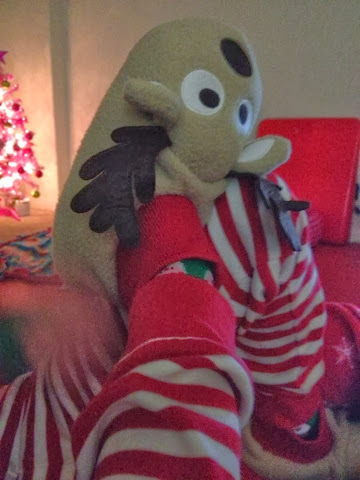 It's very difficult to have a conversation with doctors when your toddler is fussing and hanging off you (literally, he was hanging from my feet)! Anywho, I was not super impressed but we've got a slew of tests to schedule (including a gastric emptying scan, endoscopy, ph probe, and swallow study) and in the meantime we're gonna try the only elemental formula she hasn't tried...Elecare jr. 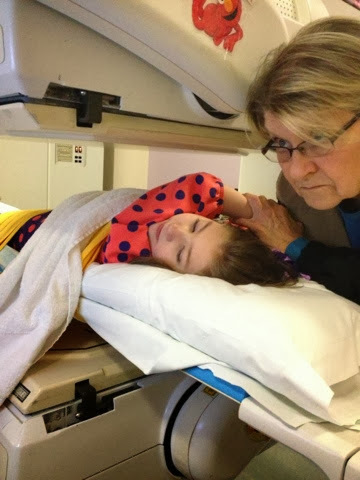 The honeymoon phase on the pediatric compleat has come to an end and now we're hoping maybe something new will help her to go back in the right direction. The GI also had another other idea about trying a g-tube for a bit instead of the gj, but I'm very nervous about that and really don't think it would work, but we'll see. 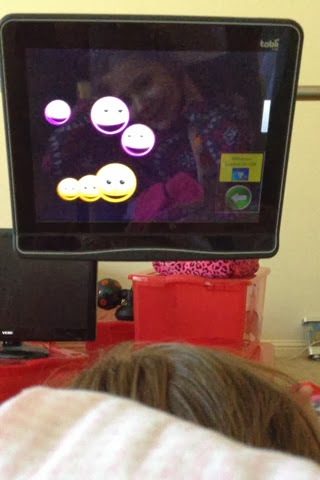 After the appt we came back home and Reagan had a joint session with OT and speech to get the hang of using her eyegaze device. Then late afternoon she had a make up session with her teacher. She did well with everything, but I did notice that she was markedly tense in her body. Picking her up was like picking up a board! She was also a lot more serious all day...definitely not the smiley laid back girl from earlier in the week. I'll admit, all of this has me a bit nervous. Today is day 5 of good days, and her last two cycles have been 6 days on, 6 days off! We always hope for the best, hope the signs we're seeing are just false alarms (and sometimes they are), but more times than not they are foreshadowing for what's to come. Please keep our girl in your prayers! We need a mild streak this go round! It's been another wonderful day today for my girl! She woke early again and was kicking around but I think she went back to sleep. I got up at 7 and she was very still so I assumed she was asleep, but at 7:30am Mike went in to check on her and she was laying there still but wide awake! So who knows! She was sweet and smiley though, so that's great! We had an early start this morning with the Tobii rep coming at 8:30! 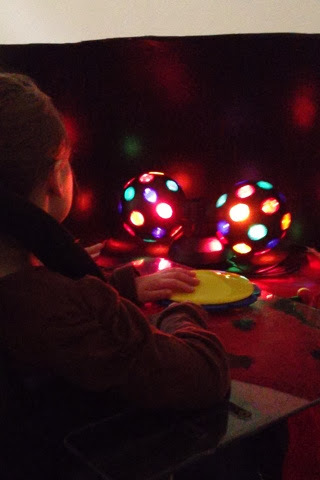 Reagan's OT, Speech therapist, and vision therapist were all here (and more wanted to attend, but we had to keep it to a minimum, 6 people was already a lot for Reagan)! We spent a lot of time just going thru and adjusting settings and backgrounds but Reagan did spend a little time on it! I have some pics and video below! As far as her care conference goes, no update today. We've got an appt with her GI doctor tomorrow morning (and the palliative care dr is supposed to meet us there), so we should find out a lot tomorrow. Praying they came up with the right plan to get Reagan on the right track! So sick of these bad days for my girl! She's been pretty laid back today. There are some arm movements that I'm a little concerned about (she's been doing it since starting Lyrica). Hopefully we can get the neuro's opinion on that. Please continue to keep her in your prayers! Meanwhile brother has had a persistent dry cough since last week so the pediatrician is putting both Reagan and Ryan on a preventative dose of antibiotics just in case he tests positive for pertussis (neither have been vaccinated)! It takes several days to get the results back! Ugh! We've got to kick the sickness! Mike has had a cough for weeks, I was really sick Tues night but just have a sore throat now, and Reagan's just had a bit of congestion (but we've done our best to keep her isolated)! I have video but I'll have to post it from the laptop tomorrow! Today has been another great one for my girl! She slept well last night (without medication) and woke bright and early at 5am again! She was happy and talkative, so I just let her be and went back to sleep. I got up with her around 7:30, she was great, such a sweet smiley girl! Still not a huge fan of us talking around her, but otherwise perfect! She had speech and school today and did awesome with both! She has also been super snuggly and took a nice little nap as well! Tomorrow (Thursday) is a huge day for my girl two very big things are happening! The first is she's getting to trial the Tobii eyegaze system for a month! Several of her therapists will be here to learn how to use it and hopefully we'll get a good understand of what it can do! I'm sure I'll be posting a lot about this over the next month, but we're all super excited to see how this can work for Reagan! Then tomorrow afternoon at 4pm all of her doctors are meeting for a care conference! This is huge and we need lots of prayers about this! 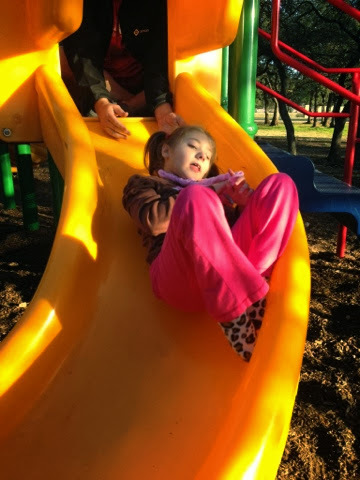 We are hoping that with all of them thinking together, they'll be able to come up with a good plan to diagnose and lessen the severity of Reagan's bad days! We seriously need lots and lots of prayers about this! These are all very intelligent people and hopefully caring people, our girl's future happiness is in their hands! Pray that they will come up with the miracle we've all been waiting for! Today has been a great day for my girl! She slept fairly well last night, she did wake up around 5am and stayed awake, but hey, she slept most of the day yesterday so who can blame her! She has been happy and very talkative all day! So nice to see my sweet girl's personality back! This morning she had a visit from her vision therapist and the speech therapist from the school. She did a great job! Afterwards her vision therapist and I went through a catalog picking out all kinds of switch toys she's going to order for Reagan. Apparently they have a good size budget for these things, so I'm super excited to try some of these with her (many of which I've been thinking about getting for years). After that she took a little nap and then we had just enough time to get a bath in before her OT came. She did some mat work with her for the first time in a week or so (because of the bad days last week). While she was here, Reagan's new PT came by to do an evaluation. We had to switch companies for PT because one of Reagan's PTs was going on maternity leave and she was going to be cut down to one visit a week! This will be better anyway. She really needs to work with the same person so there is some consistency to her routine and this new PT seems very excited to work with her. So it was a busy day for my girl! She has been wonderful though. Still a little nasal and spitty/chokey at times (hoping she stays healthy because we're all a little sick around here), but otherwise great! I love this girl! Praying for more wonderful days for her! We are super happy over here right now! Our girl is back! She woke up around midnight last night (the longest she had slept in a long time) and was still super cranky. 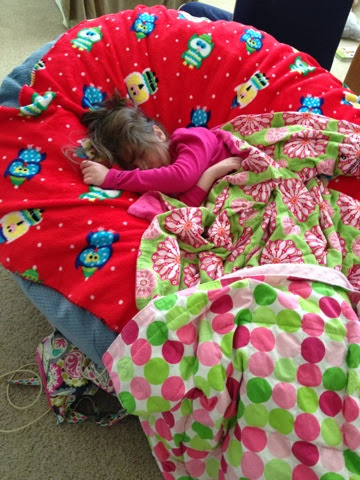 I gave her another dose of Lortab and she dozed off in her bean bag chair and slept soundly. She woke around 5am and you could tell she was different. She was relaxed and still a bit groggy, but different. I didn't have to give her anything else, she just dozed back off in my arms and we moved her to her bed! 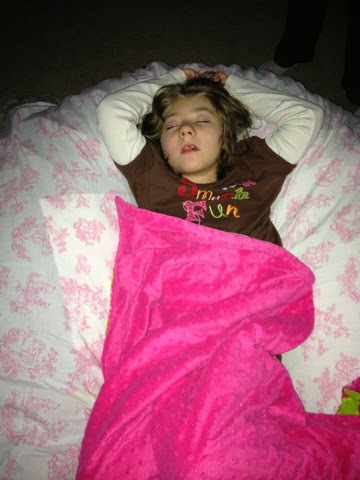 She slept there peacefully until 5:15pm (this afternoon) when she woke up all smiles! I can't even begin to describe how happy we are to see her happy again! She was still very groggy but she stayed awake until 10pm-ish. And now she's back asleep! She really needs the rest, so I'm glad she's finally able to sleep! Thank you so much for all of the prayers! Praying for many good days to come! I feel I'm beginning to sound like a broken record. Last night was another rough one. Reagan was nauseous (and agitated) and not falling asleep so I laid beside her on the bean bag chair. I'm doubtful that she fell asleep, but I did. I woke at 2am to find her awake and kicking beside me. I gave her clonidine and I laid down in bed. She woke us around 3:30am crying and we both got up with her. I tried giving her Lortab and then ibuprofen an hour later, but nothing seemed to help. She's exhausted, she NEEDS to sleep, but her body is fighting against her! It's brutal. Watching her suffer like this...this is one of the worst bad streaks in a really long time! Today is day 6 and it's just as bad as day 1. She's crying and thrashing and biting and flailing...the only improvement over yesterday is that she is sleeping here and there. When we give her medicine (that should knock her out), she's able to sleep for 15, 30, even 60 minutes before waking up crying again (yesterday nothing was working). There have been many talks about putting her in the hospital. She needs to be sedated and nothing we're trying at home is working! But putting her in patient carries many risks (including exposing her to countless infectious diseases that could realistically kill her). If they heavily sedate her in the hospital, how will we even know when her bad days are over? When do we unsedate her? And sedation alone is a scary thing! She's already been overdosed once by a physician error and almost lost her life because of a sedative. But the pain that Reagan is going through is indiscribable! We need her to snap out of this, and soon! 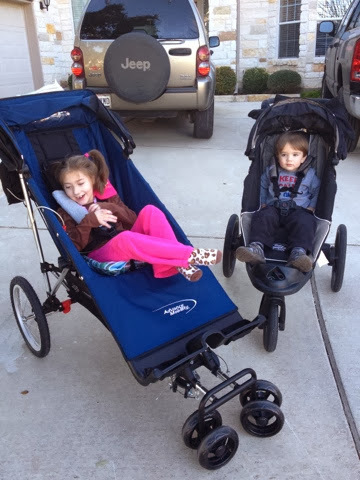 Our dear Lucy is in the hospital right this moment losing her battle with mitochondrial disease because of pain! I can't even begin to say how heartbroken I am for this family. Mitochondrial disease is a horrific, cruel disease and it's taken the lives of way too many precious angels. Please keep Lucy and her family in your prayers and pray that Reagan has a dramatic turnaround so we can avoid the hospital this go round. It's been another rotten day for my girl. I really thought today was going to be better...I thought for sure, the worst was past us...I was wrong! Reagan did not sleep much again last night. The medications just don't seem to be working on her right now. This morning she was still super stressed and tense. Grandma came early and was able to get a couple laughs out if her so I was hopeful maybe things were turning around. But shortly thereafter the crying started and she cried off and on most of the day. She definitely seemed to be in pain (thrashing and crying and stiffening her body out)! We tried everything we had to try and give her some relief (literally everything)...nothing helped! And then to add insult to injury, the nausea started up again. No throw ups, but just very nauseous. Retching, grinding her teeth, tongue hanging out...not good! She's so stressed, even trying to bite herself, we had to restrain her arm. My poor girl! Why can't she catch a break?!?! Is it too much to ask that she be able to sleep some of this off? Miserable all day and now nauseous again?!?! Seriously?!?! Ugh. I'm SO frustrated for her! So frustrated! Please pray! Reagan slept well last night (as far as we know). I woke up at 7am and looked at the monitor and she was wide awake and kicking around, but quiet. I'm not sure how long she had been awake. The good thing is, she was awake and not crying. The bad thing is, the second I went near her, she started freaking out! Changing her diaper was quite the challenge! I ended up with a kick square in the mouth! We tried both Lortab and clonidine neither was helping or making her the least but sleepy. She was very agitated and not calming down. I was texting palliative care (who was talking to her neuro) and we decided to go ahead and up her Lyrica dose 5 days in (instead of waiting the full 7 days). Approximately 30min later, her whole demeanor changed. She was still awake, but so much more relaxed. She stopped freaking out when her nurse would give her meds (or come near her) and she seemed to enjoy human interaction once again. I'm not sure if it was the Lyrica or not, but I sure hope so! It would be a huge answer to prayers if we had finally found something that would lessen these bad days. She was noticeably better the rest of the day. She was still stressed, having tons of chorea, but still improved. She sounded a bit gunky in her throat today. It's hard to tell if it's in her nose, throat, or lungs. Tonight she was coughing a little and either threw up or coughed up a little. I'm a little nervous about her sleeping laying down, but she really needs some time out of her chair! Please keep it in your prayers that she's able to sleep tonight and that she feels much better tomorrow! This girl needs a break!! It's been an awful one for my girl today. I don't think anyone really understands how bad her bad days are (her doctors, teachers, our friends and family)...I don't think we, her parents, who see it first hand day in and day out, can even begin to understand how miserable she feels on these days. 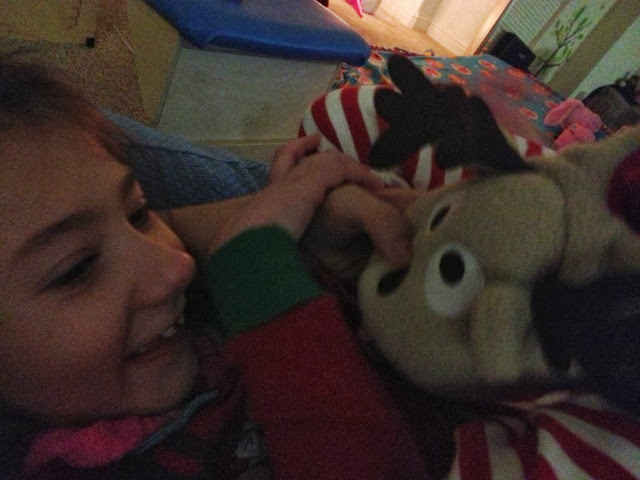 Her OT came today (one of the few therapists who has seen her on a bad day) and was telling me that out of all of the kids she's worked with, she's never seen any of them who go through anything even similar to Reagan's bad days. I was thinking about it tonight, as I watched her flail and fight sleep, it literally is torture. Her body is torturing her! For me, it's no different than watching someone pluck her fingernails off...she is literally that miserable! Last night she slept much better than I would have suspected. She woke up crying only an hour or so after falling asleep, but eventually fell back to sleep with medication. We never heard a peep out of her and then around 5am Mike wakes me up and tells me to look at her monitor. She is completely missing from the bean bag chair! I went into her room and she had slid off onto the floor! The funny thing is, she was completely upright, feet crossed on the floor and back and head resting against the chair, arms up above her head and fast asleep (I really should have taken a picture)!! We were afraid to touch her! We left her, but an hour or so later, Mike went in to check on her and she was laying on the floor face first...and still asleep!!! He picked her up, but that woke her up and she was NOT happy. The crying started and continued every waking moment the rest of the day. Poor girl. The only good thing I can say is that her nausea was gone (she can typically only do one thing at a time...cry or be nauseous) and alternating the clonidine/Lortab did a pretty good job covering her pain and keeping her asleep. The awake/miserable periods got longer as the day went on and tonight she cried for almost an hour. She was just so restless, her body was not letting her go back to sleep! I ended up having to take her weighted blanket off her legs and wrapping it around her arms and tucking it up tight behind her chair (kind of a make shift straight jacket). Poor girl! I just hope she can sleep this off tonight and wake up feeling better tomorrow! Please say some extra prayers for her! Reagan dozed off in my arms again last night (with the help of clonidine). The Lyrica definitely does not seem to be making her sleepy at all (unfortunately) and since starting it she's needed clonidine to help her fall asleep each night. Last night she woke up crying an hour or so after I put her in bed! It was as if she were having a nightmare! Her eyes were closed and she had this sad gasping cry! Poor thing! We weren't having much luck calming her down, but she finally settled down and fell back to sleep when Daddy laid down with her. We weren't sure what this meant for today, but I'm not going to lie, we were nervous! We woke again around 5:30am and she was awake and kicking around but OK. When I got up with her this morning, I could tell she was still very tense, but she was still in good spirits. She did FaceTime with Grandma and was grinning from ear to ear! Then maybe 20min later her nurse was asking me a few questions and Reagan freaked out! The tears were flowing! It took a while to calm her down, but we eventually did and the crisis was averted! She had an early session of speech shortly thereafter and did well with that (her speech therapist knows her well enough to not push her buttons)! Then this afternoon Grandpa came over to watch Ryan while we went to the orthotist. This orthotic place came highly recommended and the orthotist we saw seems very experienced. He was not happy with her high heeled AFOs (similar to Reagan's previous PT) and he thinks he can get her in a much better angle (much closer to 90 degrees). We'll see. Reagan was very sensitive...just taking her in and out of the car freaked her out (with the cold air hitting her face). We had to take her into an exam room because the opera music over the speakers in the waiting room was freaking her out! We also had to keep speaking to a minimum! The last thing we needed was a crying Reagan. She did fine! No casting today...apparently they need to get insurance approval first (in Houston they did this in advance and our first appt was casting). 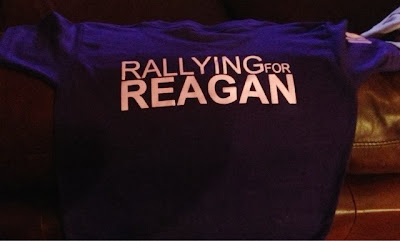 As we were leaving Reagan seemed slightly nauseous (in addition to her extreme sensitivity). I noticed this a tad last night, when she seemed a little overly spitty. I'm not sure if all of this is part of her normal cycling or a side effect of the new medication. I tried calling the neuro but apparently Dell closes at 4pm (WTH)?!?! She was very much on edge the whole way home. Very vocal with lots of crazy laughs. She held it together, but barely. She did lose it again tonight. I was on the phone with the pharmacist and thought I ran out of the room quick enough, but she heard me talking and freaked out! It took another good while before she calmed down. And then to make matters worse, the nausea really picked up tonight. Not used to seeing it before a bad cycle. I gave her clonidine hoping she'd sleep it off, but she's very restless and keeps waking back up startled and making gaggy faces! My poor sweet girl. Very sad for her and all of the kiddos out there suffering. Life is so not fair! It's been another good day today for my girl! She was up too early for my liking (4am), but she quieted down so I thought maybe she went back to sleep. This morning I found her still awake in bed with a stinky diaper (maybe that's what was keeping her up...her first of three today)! She's been a sweet girl again. Super smiley and wonderful! She's still having some temp regulation issues (super cold hands/feet & sweaty back) and seems a little sensitive (and jittery). I'm hoping it's nothing and she can keep these good days coming! I watched the movie Awakenings today. I have to say, it's a whole different movie when you have a loved one affected by a neurologic disease. So tough this life we live...the life our child lives. There's no doubt we're all better people for having lived this life, but there's not a doubt in my mind, we'd do anything to go back and save our child all of this pain and suffering! We appreciate the little things more, each day, each breath...but to go back and be ignorant again...to be unaware of children dying, never able to walk or talk, experiencing significant pain on a daily basis, living in the hospital or worse, an institution! It's awful. And this movie, it just shows how these patients (our children even in this day and age) are just guinea pigs! Robert Dinero having this movement disorder where he's either frozen up stiff or unable to stop moving for a second...reminds me of what Reagan goes through. It's so hard to watch! And then the future, well that's even more scary! 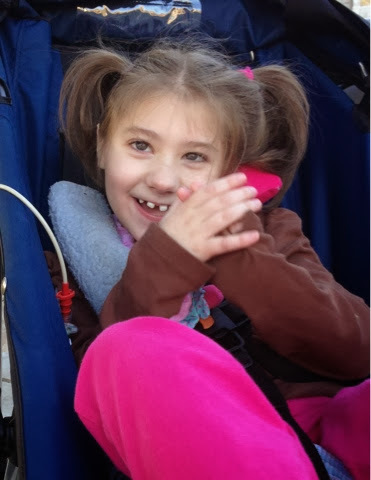 There's a precious little girl I've been following for a while now, Lucy (she has mitochondrial disease), whose parents have been told there's not anything more they can do. She's in the hospital, in a ton of pain, and all they can do is drug her nonstop to try to alleviate it! Ugh. It literally makes me sick to my stomach. I can't even imagine what these parents are going through...and I hope I never have to, but awful doesn't even come close to describing it. There are no words. So all we can do is hug on our girl and love on her and thank God that even though she has terrible bad days, she does still have good days. Today is a good day. Even though she's been up since 4am talking in her bed, she's super smiley and happy! She had a make up session of OT this morning and she did great for that. Still waiting on the trial of the Tobii eye gaze device. I'm guessing it's not yet available and that's why we haven't heard back from the rep! We're all pretty excited about it though. She's really been making great eye contact and looking at things lately (on good days of course), so we think she's going to do well with it! Now if we could just get some more good days! We started Lyrica last night (25mg), I haven't noticed any difference and it definitely didn't seem to make her sleepy (she still needed clonidine to fall asleep). There have been a few little quirks today...a mini meltdown when we tried to take her downstairs tonight, some temperature regulation issues, not sleeping as well as I would have liked last night...but I don't think any of those are related at all to the Lyrica. She's still congested, but no fever tonight so that's good! Please keep it in your prayers that our girl can continue on this good streak...she SO deserves a break! Reagan slept well last night and woke up this morning super sweet and smiley! 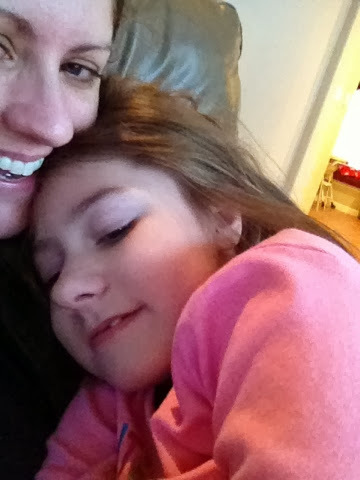 Her fever was gone by bedtime (thanks to ibuprofen) and stayed gone all day. We were up and at 'em early so we could get to her neurology appt. They squeezed us in because of all the trouble Reagan's been having lately and as it turns out, we were his only patient (he came to the clinic just to see us)! This was great because he seemed much more attentive than previous visits...I've always thought he was a smart guy, but a little too rushed! Anyway, after going back over the symptoms of Reagan's bad days, he was certain that she's having migraines! The cyclical pattern, autonomic dysfunction, hair pulling, light and noise sensitivity, and nausea...everything fits the bill. He wants us to start her on a daily dose of Lyrica (we're weaning her up) and hopefully we can prevent her from experiencing all of these things! We definitely need some prayers in this area! No negative side effects and we need something to finally WORK for our girl!! She fell asleep on our way home and took a nice little nap. She woke up in time for speech and then OT...she was great for both! Making great eye contact and very vocal! She's still congested and occasionally grinding her teeth (like she'd did last night) and then tonight her fever did come back to 100.3. She also had three huge liquidy (blowout) diapers...not sure where that's coming from but she is getting a good clean out! But she's still just as sweet and smiley as can be so that's what's important!! Thankful for these wonderful days for our girl! We're not sure how much Reagan slept last night. She was asleep when we went to bed, but around 2:45am Mike saw that she was awake. He went in there to try to get her back to sleep, but she was fighting him and even fussing a bit, so he eventually just left her alone and she quieted down but was still awake. When I woke up around 7:15am, I could hear her pump beeping. I went in her room and found her completely upside down in her bed (twisted up in her feeding tube)! She was wide awake and grinning from ear to ear, what a sight for sore eyes! So happy to see my girl!! She was a doll all morning. Super sweet and snuggly. Less chorea but her hands and feet were still pretty cold and you could tell by looking at her that she was beyond exhausted!! And no wet diaper! That's right, not since 6pm last night. She's definitely holding her urine again and I just figured out why. Her doctors have us giving her periactin as needed on her nauseous days. I haven't really noticed it helping much with the nausea but we are seeing an unwanted side effect of urine retention (that she's experienced in the past see blog post from 2010). Definitely time to discontinue that med...for whatever reason, her body just does not agree with it! Her last dose was Monday night and yesterday she only had two wet diapers (big ones, but only two) and today we're still dealing with it! Finally around 10:30am I gave Reagan a dose of Lasix and held her strattled on my lap (hoping she might let it flow)...instead she dozed off! We put her in bed and she's been sleeping ever since! So glad my girl is finally getting some sleep (she SO needs it), but sleep is not helpful in getting her to pee (she usually holds it when she's asleep)! This afternoon I pulled out all the stops, I tried everything I could think of to try to get a sleeping kid to pee (steady pressure on her tummy, hand in warm water, a heavy warm neck pillow over her bladder)...nothing! Finally tonight at 7pm I tried the pressure technique again and she moved her legs around a bit and then finally went! Whew! Never been so thankful to change a pee diaper! So my girl is still asleep and hopefully she'll sleep through until tomorrow! She's got a lot of catching up to do! Thank you for keeping her in your prayers...this was a really rough bad streak for our girl.